Corey wrote: Source of the post This deal is pretty great! Yeah that was. Over now. That's the same set I have, but I don't have the big battery with it. That is good. Don't need it though. That's what I bought and I paid $5 more a couple weeks ago! wags83 wrote: Source of the post That's what I bought and I paid $5 more a couple weeks ago! Corey joins the ranks of men today. He is getting an air compressor that is way bigger than he needs and he is getting it for something that will take 1 second to do. Tyler wrote: Source of the post Corey joins the ranks of men today. He is getting an air compressor that is way bigger than he needs and he is getting it for something that will take 1 second to do. Clearing a hose that pumps water out of his basement from what I understand. wags83 wrote: Source of the post Clearing a hose that pumps water out of his basement from what I understand. I'll provide details since he video called me yesterday to show me. Most HVAC systems drain into a floor drain. His uses a pump to pump the water up and over to a sink. The hose is blocked and he has a lot of standing water now. He needs an air compressor just to blow out what ever is clocked. I hope he takes pic of what the sink looks like afterwards. 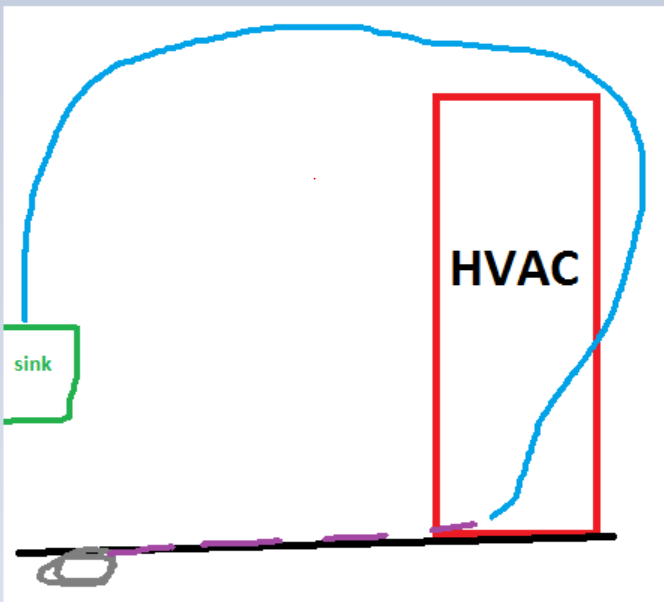 I told him to just run a hose on the ground (dashed purple line) to the floor drain on the other side of the room. It would be a minor PITA, but not bad since it's all in the back room. Nice photo! Only took me two replacement pumps to determine the line was clogged. Really looking forward to moving the giant compressor downstairs to do this! What compressor did you get? wags83 wrote: What compressor did you get? I talked him into a 21 gallon one when he only needed like 2. When I've considered getting one, I've looked at like, 6 gallon models. Wags, share your work bench with everyone. 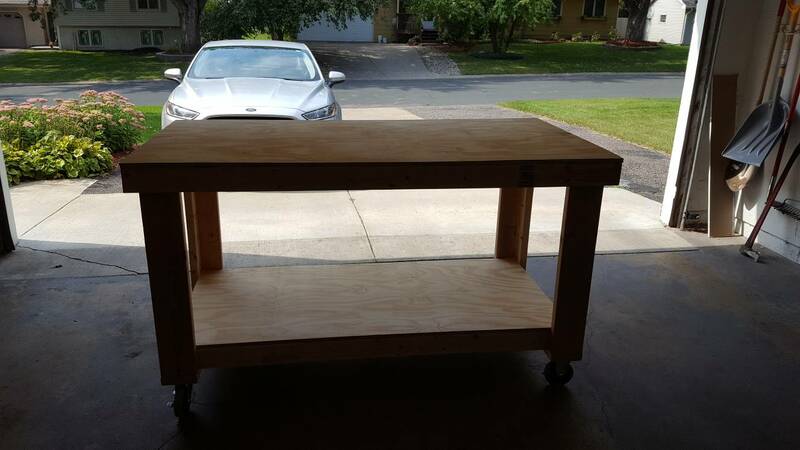 Why did you go with 6'x3' for the workbench? What did you do with the leftover plywood? Tyler wrote: Wags, share your work bench with everyone. Why did you go with 6'x3' for the workbench? What did you do with the leftover plywood? 6' length was about the longest that would realistically fit without having to make the garage too cramped and I needed a 3' depth in order for my miter saw to fit on top. Here are some pics.